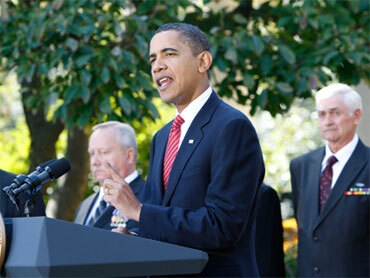 Obama: Treatment of Vietnam Vets a "National Disgrace"
It amounted to a public scolding from President Obama. He called it "one of the saddest episodes in American history" and a "national disgrace" that Vietnam veterans were often "shunned and neglected, even demonized" when they came home from the war. "On days such as this," said the president, "we resolve to never let it happen again." Mr. Obama offered that solemn reproach at the end of a Rose Garden ceremony at which he presented a Presidential Unit Citation to honor the heroism and gallantry of a U.S. Army troop in Vietnam nearly 40 years ago. He said it's "never too late" to thank those that served America in uniform. "We can never say it enough. To you and all those who served in Vietnam, we thank you. We honor your service. And America is forever grateful." Mr. Obama, who was not yet 14 when the war in Vietnam came to an end in 1975, said that gratitude "always includes showing our troops the respect and dignity they deserve, whether one agrees with the mission or not." The words were part of his tribute to the members of Alpha Troop, 1st Squadron, 11th Armored Cavalry. On March 26, 1970, that unit volunteered to come to the aid of an American infantry company surrounded by what was described as "an overwhelming enemy force" of North Vietnamese troops near the Cambodian border. "It's about the men who rushed out to drag their wounded buddies to safety; the medics who raced to save so many; the injured who kept fighting hour after hour. And finally, with dark falling, as the convoy made the daring escape back through the jungle, these soldiers remained vigilant, protecting the wounded who lay at their feet." Some of the members of Charlie Company, the unit rescued by Alpha Troop, were at today's presidential ceremony along with 86 members of Alpha. "Now some may wonder," asked the president. "After all these years, why honor this heroism now? The answer is simple. Because we must. Because we have a sacred obligation. As a nation, we have an obligation to this troop." Mr. Obama said "we have an obligation to all who served in the jungles of Vietnam: to all Vietnam vets who "answered their country's call and served with honor." Nearly four decades after that "day in the jungle," Mr. Obama, who faces decisions about U.S. military strategy in Afghanistan and whether to send up to 40,000 more troops, reflected on the lessons learned in Vietnam. "If that war long ago, teaches us anything, then surely it is this. If we send our men and women in uniform into harm's way, then it must be only when it is absolutely necessary. And when we do, we must back them up with the strategy and the resources and the support they need to get the job done." Addressing the former members of Alpha Troop, now senior citizens, the president said "our responsibility as citizens and as a nation (is) to always remain worthy of your service."